Often overshadowed in America by rivals Mercedes and BMW, especially in the mid and full-size luxury categories, Audi is looking to make the case that it is the premier German nameplate. 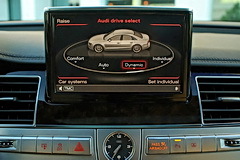 For 2011 the flagship A8 luxury sedan gets thoroughly reworked, although you’d hardly know by looking at the car. Though the styling remains largely unchanged and quite reserved, much has been modified underneath the sheet metal. By combining advanced technology with smooth, refined performance, Audi has crafted a compelling alternative to other more flashy luxury saloons. Driving the new A8 is a very deceptive experience. On the one hand, this is a big car and if it weren’t for the rearview camera and front and rear parking sensors, simply going to the store would be much more of a hassle. On the other hand, the A8 doesn’t really drive like a big car. At low speeds steering effort is almost alarmingly light, but once up to speed the wheel firms up nicely. The A8 also sits quite low to the ground, almost sports car low, which also adds to the smaller car feel behind the wheel. Audi has equipped the A8 with its Audi drive select feature, which allows the driver to adjust the dynamic steering, adaptive air suspension, transmission shift characteristics, and engine response. Put everything in comfort mode and the ride morphs into old school luxury boat levels of plush, while the dynamic mode substantially firms up the shocks and steering response, as well as placing the transmission in sport mode and increasing throttle responsiveness. The beauty of this system is that it actually works and basically gives you two cars in one, a relaxed luxury cruiser as well as an apex carving sports sedan. 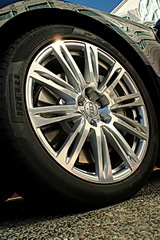 Our test car also came equipped with optional 20” wheels and wide summer tires, which give the car stupendous amounts of grip, but don’t seem to harm the ride quality at all. Combine this high performance rubber with Audi’s quattro all-wheel drive and you have a large sedan that can be pushed almost as hard in the turns as a much smaller sports car, although driving in this fashion almost seems inappropriate in such an otherwise refined automobile. Motivating the A8 is Audi’s tried and true 4.2L direct injection V8 engine, which is basically carried over from the previous generation, although additional tuning has increased output to 372 hp and 328 lb-ft of torque, up from 350 and 325 respectively. Those who simply have to have more power can look forward to the 500 hp W12 engine that will be available in the long wheelbase A8L starting next year. Although the base engine places the A8 towards the bottom in power output when compared to the competition, Audi has several tricks up its sleeve to make up the difference. The first one of these is reduced weight, courtesy of an all aluminum space frame that also increases chassis stiffness. 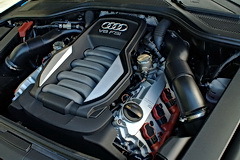 Secondly, Audi has added two additional cogs to the transmission, for a total of 8 forward gears. With smooth yet rifle-quick shifts, this transmission helps wring out every one of the 372 ponies, and improves fuel efficiency by 6% to boot. The result of this high-tech powertrain is performance that is both seductively smooth and appropriately assertive. Although a 5.7 second 0-60 time means the A8 won’t be winning every drag, real world acceleration is plenty fast, especially once at speed. Mash the throttle and the transmission almost instantly drops down 3 or 4 gears, but as soon as you let up it returns to top gear with upshifts that are almost imperceptible. We were able to experience the fuel-efficiency benefits of a relatively small engine mated to a flexible transmission on a road trip to the Pebble Beach Concours d’Elegance in Carmel, CA. While cruising around in 8th gear on the freeway we easily achieved an honest 26+ mpg, an impressive feat for such a big and powerful car, especially one with wide, grippy tires and all-wheel drive. This car is sooo gangster. It’s got a mean front facia. But driving it around, it is just truly impressive. It is so smooth and refined. Look at that engine bay!!! Anyway, I want to be an Audi owner. For German Cars it works like this Mercedes S is for those unsure of there status .BMW 7 is has been really unsuccessful in it’s large Cars and you can tell there heart is not into it.When it comes to Audi it for those who know themselves and really most importantly they know how to drive. Audi builds cars for drivers and this car is so modern .The usual markings are stripped away and the car is so pure in look.Who needs leapers,stars and the effluvia that mark a luxury that’s part of what ruined the American luxury sedans.It will be very hard to choose between Porsche Panamaera and the A8. That’s why the Germans economy has recovered so well they build great things even with high taxes .